Horses throughout history have been alternately our beloved beasts of burden and our companions. They have served a purely utilitarian purpose for farming, transport and food. They have been our artistic and spiritual inspiration. Horses have been symbolic, spiritual animals. The raw corporeal power and keen sensitive, sharp witted demeanor of horses have made them the endless subjects of art throughout history. The horse evolved over the past 45 to 55 million years ago and was only domesticated on a wide-spread scale from 4,000 BC. The Lascaux Caves are one of the oldest examples of Paleolithic cave art that depicts horses among other animals. This cave art located in the region of Dordogne, southwestern France is dated to 17,300 years old. The artists led a life that was respectful and reverent to the raw power of animals. The art depicts the real life ecological relationships between animals. There is a bison-lion-horse depiction as well as a auroch-horse-deer-bear depiction. These animals would have coexisted in the same environmental conditions. The horse was important in ancient Celtic-Gaulish-Roman tribes. One of the most important deities was Epona, also known as the horse-mother or the protector of donkeys, mules and horses. She was worshiped by many tribes throughout Europe and also had a cult within the borders of Rome, the only Celtic goddess to have this honour. She was particularly used as a cult of fertility and her benevolent presence was found in bountiful ears of grain and a bumper number of foals in the spring time. Epona and her horses were also travelling guardians protecting human souls on their journey to the afterlife. A relief of the Gaulish/Celtic horse goddess Epona from Salonica, Greek Macedonia, 4th century CE. According to the museum’s label, Roman emperor Galerius may have been responsible for introducing the worship of Epona at Salonica. The Scottish legend of the Kelpie is a water dwelling creature that inhabits the lochs and bodies of water in Scotland. According to folklore it shape-shifts from a horse into a human form and was said to be dangerous to humans. 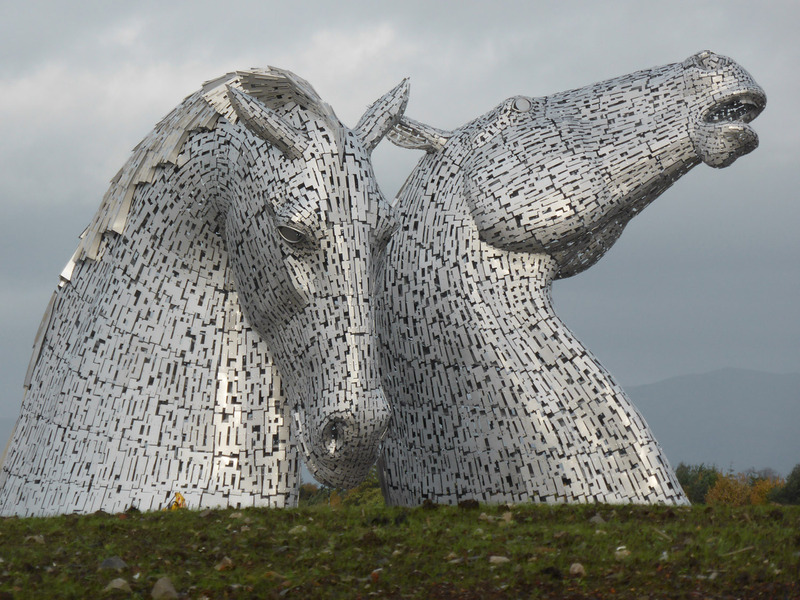 In Falkirk, Scotland two gigantic 30 metre steel horse monuments weigh collectively over 50 tonnes. These horses are dedicated to the Scottish legend of the kelpie, a mythical equine water-dwelling creature. According to sculptor Andy Scott, The Kelpies were a nod of respect to the endurance of horses and their historical contribution to Clyde Valley and the landscape of the inner waterways. After the Industrial Revolution, where did all the horses go? Humans quickly embraced the mechanical superiority of horsepower in cars and omnibuses over horses. Humans were dismayed and disgusted by the fact that horses ate and shat all over the place, leaving in their wake a trail of manure. Horse manure was the bane of existence for every Victorian town planner. In 1894, the Times of London estimated that by 1950, every street in the city would be buried in nine feet of horse manure. Also, despite their comparably slow speed, horses were responsible for a great number of human deaths from road accidents during the pre-industrial age. The death knell rapidly sounded for the urban domesticated horse. Where did they go? Horse populations fell dramatically with the onset of the Industrial Revolution, and the remaining horses that did breed, were bred purely for the race track or for entertainment purposes like in circuses, leisurely and quaint rides, or petting zoos. The glamour, fashion and hype that surrounds the Melbourne Cup season every year all but consumes the darker side of the story. This is a narrative that’s missing from mainstream media. The story of how every year 15,000 racehorses that aren’t fast enough are sent to the slaughter. Their meat is generally used for pet food but occasionally for niche human food products. Horses that do fit the bill for racing are subjected to exhausting and cruel training which can result in their severe injury or death. But why is that? Of course, it’s because of tradition and because people love to gamble on horse racing. It’s because of money and sponsorship and TV deals. That’s an immovable obstacle at present and the horses themselves are forgotten in all of that. Horses are keenly sensitive, gentle, inquisitive, powerful and special beasts. In ancient times, (cave painting times) humans hunted them, domesticated them, using them as companions. Although at the same time, people respected them, cared for them and revered them. Their sacrifice and duty was rewarded by ritual and devotion. Now horses are nothing but playthings and commodities in a circus of consumerism. What can we do? I would start by signing this petition about horse racing.